TurboCAD Pro Platinum is a professional 2D/3D CAD application. Access a powerful drafting palette, ACIS® solid modeling, premium photorealistic rendering, advanced architectural and mechanical toolsets, AutoCAD-like 2D drafting interface options, and extensive file support. TurboCAD Pro Platinum 2017 provides nearly 50 new and improved features, plus stability enhancements. Watch this New Feature Video which highlights some of the top new features. 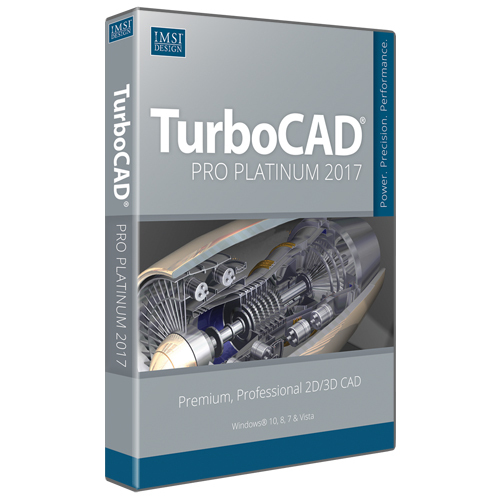 NOVATO, CA--(Marketwired - March 15, 2017) - IMSI® Design, a leading CAD software developer, announced today the release of TurboCAD Pro Platinum 2017, the company's premium 2D drafting and 3D Surface and Solid modeling application for Windows® desktop PCs. "TurboCAD continues to amaze me," writes Val Carter of Tri-CAD Technologies in a recent review of TurboCAD Pro Platinum 2017. As a dedicated user and developer of various TurboCAD training products since 2000, Carter adds, "what was most apparent this year is the amount of work the company has put into the creation of rock-solid operational stability as well as the introduction of project integration methodologies". New Intelligent File Send - E-pack, which gathers all design related content into a common folder with the drawing for easy distribution, now includes an option to send your packaged data via email directly from e-pack to speed productivity. New Image Management Palette - Adds simple drag-and-drop insertion, control of image parameters, and embedding. New Table Editing / Attachable Data - Build tables by making (non-OLE) connections to .CSV and Excel files. Simply edit table layout, format, and content, now similar to Microsoft Word. New Timestamp - For security and collaboration, file metadata now includes Date of Creation, Date of Last Modification, Total File Editing Time, and Total Time of Last Session. New Center Line and Center Mark - Create associative center lines and center marks. Improved Multi-Text Editor - New text editor interface with new formatting features and new options including numbered lists, bulleted lists, and multi-column support. New Scale by Two Points - Scale a set of objects to a specific size by using two reference points. Improved Intelligent Scaling - Create hatches, text, and dimensions that automatically scale to the current zoom level of the view. New Bend by Sketch - Bend single or multiple flanges off of a sheet body using a 2D polyline as the profile. New Gusset - Easily add support structures to 3D models. Use the New Sheet Metal Gusset to insert a sheet metal gusset between two adjacent faces. New Solid Gusset can insert a Stiffening Rib between two adjacent faces. Improved Law Tools Editor - Import and export Laws (Curve from Law; Surface with Laws; Offset with Law; Warp Entity by Law) from text files. New Stretch Entity - Stretch any ACIS solid along an arbitrary axis. Improved NURBS Support - Guidelines for lofts can now be post-updated to modify the resulting loft. Now true NURB surfaces can be generated and edited in three axes. New Unbend Options - New Get Bend Angles option to extract or insert bend angles as text when using the Unbend Sheet tool. New Unbend Along an Edge lets you selectively unbend elements of a sheet body along specified edges. New & Improved SMESH Tools (Sub-D Modeling) - New Combine and join adjacent coplanar faces; merge SMESHs; add or delete facets from a SMESH; create a volumetric object from a planar SMESH. Improvements to node selection which can be limited to ignore all but the closest nodes, and faces can now be split by a selected line. New Copying of Architectural Objects - Use the copy and array tools to insert a set of windows or doors into a wall for greater productivity. New Fit to Scale for Door and Window Custom Blocks - Automatic fit to wall width scaling of custom door and window blocks inserted into walls. Improved House Builder Wizard - Create rooms on multiple workplanes for quick design of multi-story houses. New Stair by Linework - Create complex and advanced stairways via a set of 2D linework. New Roof Slab Openings ­ - Insert openings into roof slab for fast placement of vents and skylights. New Redsdk 4.2 Engine Migration - Improved photorealistic rendering with new shaders, more realistic materials, new expanded parameters to control anti-ailiasing, caustics for sun lighting, physical sky lighting, geo-located sun positioning, and volumetric effects. New UV Mapping of SMESH Objects - UV mapping has been expanded to support SMESH objects. Improved SketchUp (SKP) File Support - Import geometry, views, materials, and components from SketchUp files created in SketchUp Pro or SketchUp Mark versions 3.0 to 2017. New Google Earth (KML and KMZ) File Support - Import KML and KMZ files into TurboCAD to view your designs in Google Earth independent of the web. Improved Point Cloud (PCD, PCG, XYZ, ASC) File Support - Improved triangulation tool allows users to adjust the default parameter settings, offers an improved algorithm for facet normal determination, and a new smoothing option. Colored point clouds are also now supported. New Mobile App Support - Import and View TurboApp (TAP) files from mobile devices. TurboCAD Pro Platinum 2017 is now available for $1,499.99 USD for a full, permanent license, $499.99/year for an annual subscription. For more information, download a 30-day trial, or to upgrade online, please visit www.TurboCAD.com or call IMSI Design at 1.800.833.8082 (+1.415.483.8000). IMSI Design is a global leader in mechanical and architectural CAD (Computer Aided Design) and a pioneer in mobile solutions for the AEC (Architectural, Engineering, and Construction) industry. With over 16 million products distributed since 1988, IMSI Design products include the award-winning TurboCAD®, DesignCAD™, TurboFloorPlan®, TurboViewer®, TurboReview®, and TurboSite® families of precision design applications for desktop and mobile. Please visit www.TurboCAD.com for more information. © 2017 IMSI Design, LLC. All rights reserved. IMSI and TurboCAD are registered trademarks and/or trademarks of IMSI Design, LLC. AutoCAD is a registered trademark of Autodesk. All other identifiable marks are the property of their respective owners.